*The Arab League is formed with the adoption of a charter in Cairo, Egypt. *Generals Eisenhower/Bradley/Patton attack at Remagen the Rhine. *The most popular mode of public transportation is still the streetcar. Millions of Chicagoans ride the streetcar during the war. (Photo: Genuine 1945 Chicago streetcar). 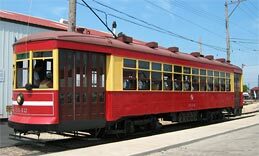 The last streetcar will be retired in 1957. *Two future stars from Chicago are serving in the military. Nelson Algren celebrates his 36th birthday while serving as a private in the US Army in Europe. Future movie and television star Karl Malden turns 33 while serving as an NCO in the 8th Air Force. He is still known by his given name: Mladen George Sekulovich. *Another Chicagoan, John Paul Stevens is serving as code breaker in the Pacific for the US Navy as he turns 25 this week. He will become a Supreme Court Justice. *Paul McNutt, the head of the War Manpower Commission, makes a major announcement: baseball players will not be subject to the draft if they leave their military-exempt jobs. Suddenly all of the missing players in major league baseball come out of the woodwork. For the Cubs this means the arrival in spring training of their star slugger Bill Nicholson (photo), and their two best starting pitchers; Claude Passeau and Hank Wyse. *“On the Atchison Topeka and the Santa Fe” by Johnny Mercer is the #4 hit of the year. *Werner Klemperer turns 25. He is serving in the Army–the US Army, not the German army. He is with the Special Services Unit in the Pacific. *Norman Fell, the future Mr. Roper, is serving as a tail gunner in the United States Army Air Force. He turns 21 this week. 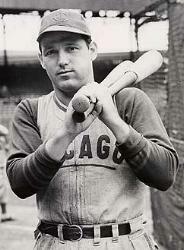 Johnny Moore is the oldest player on the 1945 Cubs; he is 43. The Cubs won’t call him up until September. Moore is one of the former major leaguers that picked up baseball again after many years out of the game, taking advantage of the manpower shortage caused by the war. In his case, it has been eight years. 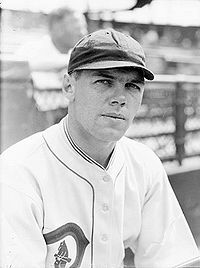 Moore had played for the Cubs in the late 20s and early 30s (he even got into the 1932 World Series), and the Cincinnati Reds and Philadelphia Phillies in the mid 30s, but hasn’t been in the majors since 1937. After the Cubs call him up, the big outfielder gets in a total of only seven games. He gets one hit in six at-bats, his final hit as a big leaguer.